Marc Chagall’s The Bible series is a collection of 105 hand-colored, religious-themed etchings depicting scenes from the Old Testament. 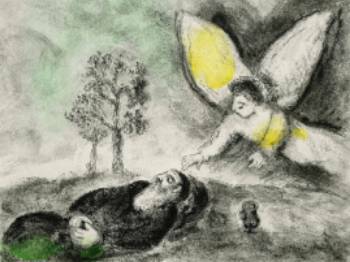 Chagall created The Bible series over a 25-year period. He was originally asked to begin the series in 1931 by Ambroise Vollard, a Parisian art dealer and publisher who has previously commissioned Chagall to illustrate Nicolai Gogol’s Dead Souls and Jean de la Fontaine’s Fables. In preparation for the project, Chagall traveled to Palestine and completely immersed himself in the history of the Jews. He also went to great lengths to study extreme examples of religious paintings by artists such as Rembrandt and El Greco, and then used these experiences and studies to humanize the images he created for The Bible. Based on his travel and research, Chagall synthesized elements from diverse cultural and artistic traditions. Because he approached the Old Testament narratives as a set of stories and recurring themes to be broadly interpreted, rather than literally illustrated, Chagall was able to produce a deeply human and personal body of work that remains relevant today.